Trevor Nunn will begin his stint as artistic director of the Theatre Royal Haymarket in March by directing Sienna Miller in Terence Rattigan's Flare Path. The rest of Nunn's Haymarket season is still to be announced but there is a strong rumour that over the 12 month period one of the productions will be Stephen Sondheim’s Follies. As mentioned last year, Nunn will need to sign a major box-office name before he will get the green light for Follies as it will cost something in the region of £2 million. I'd like to see the Rattigan play very much but I have never seen Sienna Miller in anything-is she good? 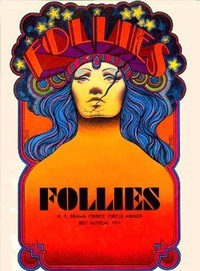 Follies was last seen in London in 2002 in a concert production staged at the Royal Festival Hall. The last time it was staged as a full production in London was the Cameron Mackintosh/Mike Ockrent production at the Shaftesbury in 1987. I saw it at the Royal Festival Hall and even in its concert form you could see a lot of money had been thrown at it. To give you some idea why it’s so expensive to stage as a full production is that the last time it was on Broadway there was a full orchestra, cast of more than 30 plus a chorus of 14. There are also loads of scene changes and a number of spectacular numbers which need some spectacular costumes to match! I suspect Sienna Miller has been cast in a play which was written by Rattigan in 1942 and set in WW2 to draw in a younger audience. It’s certainly not a play I care for. As far as I am aware Miller’s stage work has only included amateur productions when she was living in New York City. She has certainly won critical acclaim for some of her film roles and she has got Trevor Nunn to direct her West End theatre debut in Flare Path so hopefully it will do well. Perhaps I'll settle for Cause Celebre then-at least Ann-Marie Duff can act.